Do you know a student who needs to write a report about electricity? 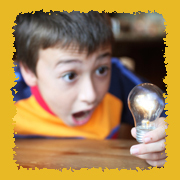 Or do you just want to know more about some aspect of electricity that's caught your interest? You've come to the right place. Simply click on the questions below, and you'll be on your way! How many miles of power lines are there in the U.S.? Do the words "shocked" and "electrocuted" mean the same thing? Why can you sometimes see a spark if you can't see electricity? When a circuit is open, do electrons go backwards, or do they just stop? Why does electricity try to get to the ground, and what does it do when it gets there? Why can a bird stand on a power line and not get shocked? How much energy is in a bolt of lightning? Does lightning ever strike fish? Who holds the world's record for being struck by lightning most often? Why didn't Ben Franklin get electrocuted when he tied a metal key to a kite string and flew the kite in a thunderstorm? Why shouldn't I use a corded phone or electrical appliance during a thunderstorm? How do batteries create electricity? Why don't I get a shock when I touch a battery? What are those little boxes on hair dryer cords? Do electric eels really create electricity? Electricity is a form of energy that starts with atoms. Atoms are too small to see, but they make up everything around us. An atom has three tiny parts: protons, neutrons, and electrons. The center of the atom has at least one proton and one neutron. At least one electron travels around the center of the atom at great speed. Electricity can be created by forcing electrons to flow from atom to atom. Most electricity used in the United States is produced at power plants. Various energy sources are used to turn turbines. The spinning turbine shafts turn electromagnets that are surrounded by heavy coils of copper wire inside generators. This creates a magnetic field, which causes the electrons in the copper wire to move from atom to atom. Electricity leaves the power plant and is sent over high-power transmission lines on tall towers. The very strong electric current from a power plant must travel long distances to get where it is needed. Electricity loses some of its strength (voltage) as it travels, so transformers, which boost or "step up" its power, must help it along. When electricity gets closer to where it will be used, its voltage must be decreased. Different kinds of transformers at utility substations do this job, "stepping down" electricity's power. Electricity then travels on overhead or underground distribution wires to neighborhoods. When the distribution wires reach a home or business, another transformer reduces the electricity down to just the right voltage to be used in appliances, lights, and other things that run on electricity. A cable carries the electricity from the distribution wires to the house through a meter box. The meter measures how much electricity the people in the house use. From the meter box, wires run through the walls to outlets and lights. The electricity is always waiting in the wires to be used. Electricity travels in a circuit. When you switch on an appliance, you complete the circuit. Electricity flows along power lines to the outlet, through the power cord into the appliance, then back through the cord to the outlet and out to the power lines again. Electricity travels fast (186,000 miles per second). If you traveled that fast, you could travel around the world almost eight times in the time it takes to turn on a light! And if you had a lamp on the moon wired to a switch in your bedroom, it would take only 1.28 seconds after you flipped the switch for electricity to light the lamp 238,857 miles away! Volts, amps, and watts measure electricity. Volts measure the "pressure" under which electricity flows. Amps measure the amount of electric current. Watts measure the amount of work done by a certain amount of current at a certain pressure or voltage. To understand how they are related, think of water in a hose. Turning on the faucet supplies the force, which is like the voltage. The amount of water moving through the hose is like the amperage. You would use lots of water that comes out really hard (like a lot of watts) to wash off a muddy car. You would use less water that comes out more slowly (like less watts) to fill a glass. There are hundreds of thousands of miles of high-voltage transmission lines in the U.S. and many hundreds of thousands more miles of distribution lines that carry electricity to our homes. No! Someone can be shocked by electricity and survive. But when we say someone has been electrocuted, it means they have been killed by electricity. You can't see electricity when it is flowing through a circuit. But if electricity leaves the circuit—like when someone is shocked—you can see a spark. The spark isn't electricity itself. It is a flame that happens when the electricity travels through the air and burns up oxygen particles. Neither! In the wires of an electrical circuit, the electrons are always jiggling around. When a circuit is closed to run an appliance or a light bulb, the electrons jiggle a lot and travel through the wire. When the circuit is open, all the electrons just jiggle where they are—kind of like running in place. It's just the nature of electricity to move from an area of higher voltage to an area of lower voltage, if given a path to travel there. The ground is simply the lowest-voltage area around, so if you give electricity a path to the ground, it will take it, no questions asked! When electricity goes into the ground, the earth absorbs its energy. It is easier for electricity to keep flowing through the power line than to go through the bird. But if a bird with large wings touches a power line and a tree or power pole at the same time, it provides electricity with a path to the ground, and could be shocked. And if a bird touches two wires at once, it will create a circuit—electricity will flow through the bird and likely electrocute it. The shock you feel when you touch an object after walking on carpet is static electricity. When you drag your feet across carpet on a dry day, electrons from the carpet get transferred to your body. If you then touch a piece of metal, such as a doorknob, the electrons jump to the metal and you'll feel a shock. Lightning is a large discharge of static electricity. During a thunderstorm, clouds build up a charge. When there is a big difference in charge between the cloud and its surroundings, the cloud discharges a lightning bolt. One lightning strike can carry up to 30 million volts—as much electricity as 2.5 million car batteries. Yes, it does. Because water conducts electricity, when lightning strikes water it spreads out along the surface. Any fish near the surface of the water get electrocuted. According to Guinness World Records, Roy G. Sullivan, a former U.S. park ranger, was struck by lightning seven times over the course of his 35-year career. Lightning has burned off his eyebrows, seared his shoulder, set his hair on fire, injured his ankle, and burned his belly and chest. Ben Franklin's famous key did give off an electric spark. But lucky for Franklin, the kite was just drawing small electrical charges from the air. If the kite had actually been struck by lightning, Franklin would have been killed! There is a very small chance that a lightning strike could surge through phone lines or through the wires of an electrical appliance. If you were to touch a phone or appliance at just that moment, you could be shocked. A chemical reaction within the battery forces electrons to move. There is not enough voltage in a regular household battery to cause a shock. However, car batteries are powerful enough to shock so you should never tamper with them. In the early 1980s there were about 18 deaths a year caused by hair dryers falling into bathtubs or sinks filled with water. Since 1991, hair dryer manufacturers have been required to include GFCIs (ground fault circuit interrupters) on dryer cords. GFCIs cut off electricity to prevent serious shock. Thanks to these devices, the number of hair dryer related deaths has dropped to an average of two per year. Yes! An electric eel uses chemicals in its body to manufacture electricity. A large electric eel can produce a charge of up to 650 volts, which is more than five times the shocking power of a household outlet. Inside the cells of the heart, tiny electrical currents fire in a steady rhythm. If that rhythm is disrupted due to disease or injury, a heart attack can occur. A defibrillator shocks every cell in the heart at the same time, so they all start up again in rhythm. It's like each cell is dancing to the same beat!